This time My TV & My Art took me to Pakistan, our neighbour, which is a lot like us but seems exotic to many mainly because of inaccessibility or its ‘difficult to get a visa’ factor. It was for a recce on ‘truck art’ for a special TV show that I have been working on. The trucks there are moving installations. They bring life to dusty grey roads. On the mountains they look like jewel carts, shining differently in the different lights of the sun. That’s what Pakistan’s trucks are to me. They remind me that beauty is sometimes a surprise. Where there are so many similarities between India and Pakistan, it’s surprising that there’s nothing remotely similar to Pakistan truck art in India. In Pakistan, it takes on an ‘industrial scale’. There’s a whole bazaar dedicated to truck ‘body-building’. It is here that the truck gets its four walls and tankers get huge storage cylinders. Other things like extra bumpers are also added here, the front is given a ‘crown’ and changes made in the chassis at the specific instructions of the truck owner. There’s another bazaar for chamak patti (reflective tape) work and truck accessories. Chamak patti designs turn the trucks into neon ships at night. At the Painting bazaar, painters fill the rest of the body with intricate patterns. The next stop is the accessories market. The shops here sell parandas, bead strands, stickers, scarves, jhalars etc. The truck now has the glamour of a bride. Not too long ago, these beauties of the road were seen to be an aesthetic nightmare and plans were initiated to have them grounded. But better sense prevailed when some lovers of art took it upon themselves to revive it in the name of kitsch art. What followed was a gradual international acceptance. 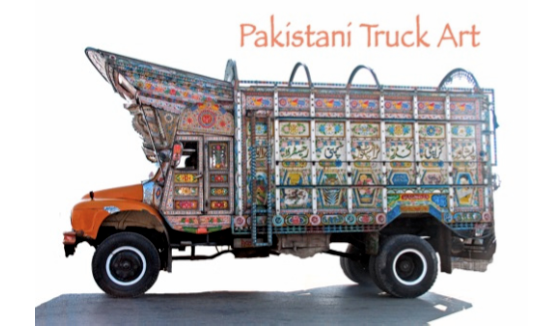 Today, Pakistani truck art is much sought after by collectors and museums from Sydney to San Francisco. Anjum Rana is one the pioneers of the truck art movement. She is also got his year’s UNESCO quality certification. Rana has brought truck art to teapots, mugs, mirror, garden benches, bikes, table fans, jewellery boxes and beach umbrellas. Her efforts of the last decade, has given truck art a place of pride in fashionable homes across the world. Which brings me to the mention of something else that I feel needs access to fashionable homes across the world. Contemporary Pakistani art. While collectors in Pakistan often seek to invest in masters like Sadequain, Gulgee or Jamil Naksh, Pakistani contemporary art has yet to whet their appetite. But the market for contemporary artists in Pakistan lies abroad. Naiza Khan is listed with Rossi & Rossi in the UK. Rashid Rana and Huma Mulji have caught the eye of Charles Saatchi of Saatchi Art Gallery. Neo-miniaturists from Lahore’s National College of Arts are known and collected for their distinct miniature style. Artists like Waseem Ahmed and Mohammad Zeeshan are immensely popular in India with their politically sensitive miniatures. The artists’ residency programme, VASL routinely collaborates with its counterparts in South Asia, residencies like KHOJ in India and Theertha in Sri Lanka. Nukta Art, a magazine ensures that a dialogue is kept alive between artists, critics and collectors. And this is just a sneak peek, because the art scene in Pakistan is really raring to go. It’s finally asking for some respect that it’s long been denied. It is letting the world know that they are serious about art and about freedom. For years, the Frere Hall in Karachi was shut to the public for security reasons as it stands right opposite the US consulate. It was a huge loss because this British town hall that was changed to a public space for art shows, houses a ceiling mural done by Sadequain. It lies half done because he died in the middle of the project in 1987. And this fact lends a sense of being watched over by the artist. But thankfully, there was a public art opening in Frere Hall this November, renovated and crisp, ready to be the art hub that it used to be. The show was titled “Don’t Mess With Karachi”. It was an installation and photography show on the city, waste management and other civic issues that trouble every Karachi-ite!! I strongly feel that a lot more maturity of style and perspective should have gone into the show. Doing a public art show for debuting artists in Pakistan is commendable but the effort shouldn’t end there. It’s also important to make a statement with the works curated for such a show. And perhaps that’s why, I found myself looking more at the decades old Sadequain ceiling instead. There is also an effort to bring this dialogue out into the public sphere. The Second Floor or T2F as its commonly known in Karachi, is a café that holds an open house every weekend. Artists, writers, poets and musicians come here and share their stuff with the city’s happening crowd over coffee and sandwiches. I showed two of my favourite TV stories. A show on India’s ‘new media’ stars like Subodh Gupta and Mithu Sen and another on MF Husain’s life in Dubai. I was flooded with questions ‘about the art scene there’. When will Husain return? Does Subodh really sell for that much? When will you do a show on Pakistani art? I also met sculptor Amin Gulgee, he is the son of Gulgee, Pakistan’s Gujral. This December marks a year of Gulgee and his wife’s brutal murder in Karachi. They were beaten to death by their domestic help. Amin is still busy running to the courts, Gulgee’s Clifton bungalow that houses most of his works is currently sealed. There are plans to soon open it as a Gulgee museum. It’s uncanny how on a previous trip to Pakistan I had interviewed Gulgee for an Independence Day special.